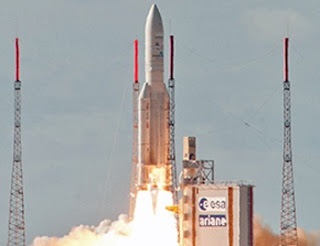 India's advanced meteorological satellite INSAT-3D was successfully launched by an European rocket from the spaceport of Kourou in French Guiana early on Friday, giving a boost to weather forecasting and disaster warning services. European space consortium Arianespace's Ariane 5 rocket launched INSAT-3D and Alphasat satellites. According to ISRO, INSAT-3D adds a new dimension to weather monitoring through its atmospheric sounding system, which provides vertical profiles of temperature, humidity and integrated ozone from surface to top of the atmosphere. The imaging system of INSAT-3D has significant improvements over that of KALPANA and INSAT-3A, the space agency said. INSAT-3D will provide continuity to earlier missions and further augment the capability to provide various meteorological as well as search and rescue services. INSAT-3D had a lift-off mass of 2060 kg. INSAT-3D also carried the newly developed 19 channel sounder, the first such payload to be flown on an ISRO satellite mission. The Data Relay Transponder (DRT) will be used to receive meteorological, hydrological and oceanographic data from remote, uninhabited locations over the coverage area from Data Collection Platforms (DCPs) like Automatic Weather Station, Automatic Rain Gauge and Agro Met Stations.